"Sigurd Islandsmoen's Requiem for soloists, choir and orchestra is a unique flower in the Norwegian music flora. Throughout the 1940s and 50s the work enjoyed huge success both in Norway and abroad thanks to its beautiful and accessible latin and folk music based musical language. And then, mysteriously, the music disappeared and the work was buried in the dust of oblivion for several decades. BUT NOW IT HAS BEEN REVIVED AND RESTORED TO ITS FORMER GLORY, A SOURCE OF INSPIRATION TO FUTURE GENERATIONS." Islandsmoen's Requiem was composed in 1936-37 and performed several times both during and after the war, and in 1949 a performance in Bergen was broadcast by NRK, but it has seldom been performed since. Islandsmoen received his most important musical training from Max Reger, and his music belongs to the style of late romanticism, the Requiem being no exception. From the 1950s onwards there was a much stronger demand for modernism in Norwegian music; Islandsmoen's works were considered out-of-date and inappropriate. One main special characteristic of his Requiem is that it builds to a certain extent on folk tunes from Valdres. He had himself been there in 1934 to collect folk tunes. 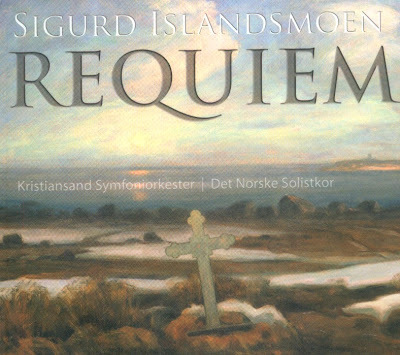 Folk music material was an important source of inspiration to the composer, but it is clear that most of the thematic material in the Requiem is Islandsmoen's own. The SACD was released by 2L, 2006, (DDD) . 2L 36SACD.